Heavy Wooden Pallets for Warehousing is the most economical solution available in market. 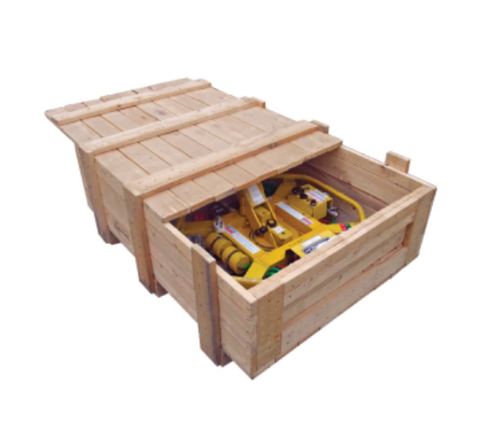 Allour wooden pallets are designed for heavy duty storage in warehouses. Widely used in warehouses of industries and logistic companies, these are available in different sizes. For complete assurance of quality, we duly test these pallets for their load bearing strength and ability to sustain in adverse weather conditions. These pallets are reusable and stackable. For effective and protected storage of goods, we make sure to heat treat these pallets in accordance with ISPM standards. It has an excellent capacity to bear heavy load with no risk of damage and breakage. Made from high grade wood, these are anti termite and properly insulated. Manufacturer and supplier of packaging products like 2 way over length pallet, heavy weight 2 way pallet and pinewood box along with packing services like bolted packing, on site packing, panel packing, stretch wrap and vacuum packing.